First picture of our new truck, the day after she arrived home. So, we did it. We bought a pickup truck! 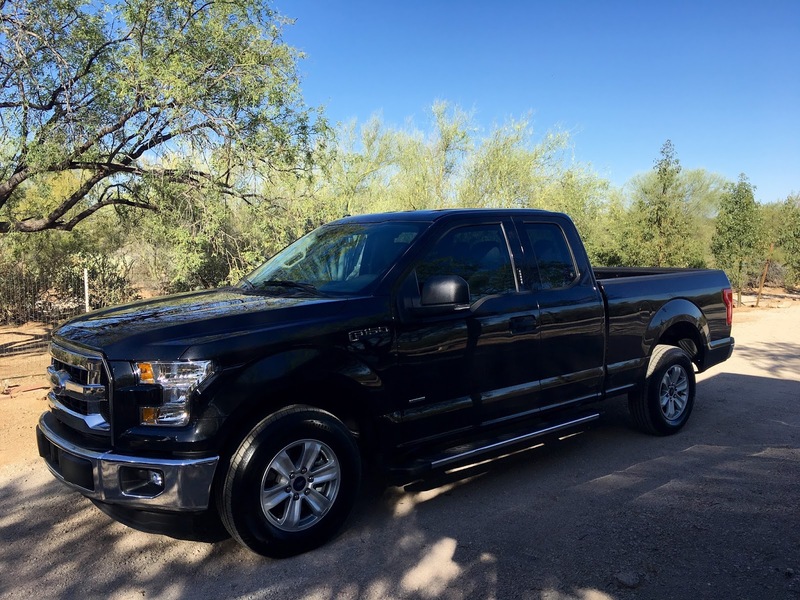 A brand new, fully-loaded, Ford F-150 XLT SuperCab. It drives like a car, very smooth, has a great sound system, powerful 3.5 liter Eco-Boost V6 engine, a special-ordered 36-gallon fuel tank, power everything, back-up cameras, twin turbos (whatever that means), and among all the other bells and whistles, can tow 12,000 pounds. Now Ed is searching for something to tow - boat, fifth-wheel, utility trailer, etc. The color is Tuxedo Black, which is a metallic black just like our big rig. So now we have the big truck and the little truck. 2006: Can Someone Define Their Purpose?? 2005: Sorry, no post for this day.